It may be Mickey’s favorite food, but it’s hardly mine. Yep, Mickey’s very first words were “Hot Dogs!” in the 1929 film Karnival Kid. He does the “Hot Dog Dance” in every episode of Disney Junior’s Mickey Mouse Clubhouse(much to my youngest granddaughter’s delight!). And you can often catch him shouting “Hot Diggity Dog!” when he’s excited or pleased. So it’s pretty clear that Mickey loves his hot dogs. But me – not so much. 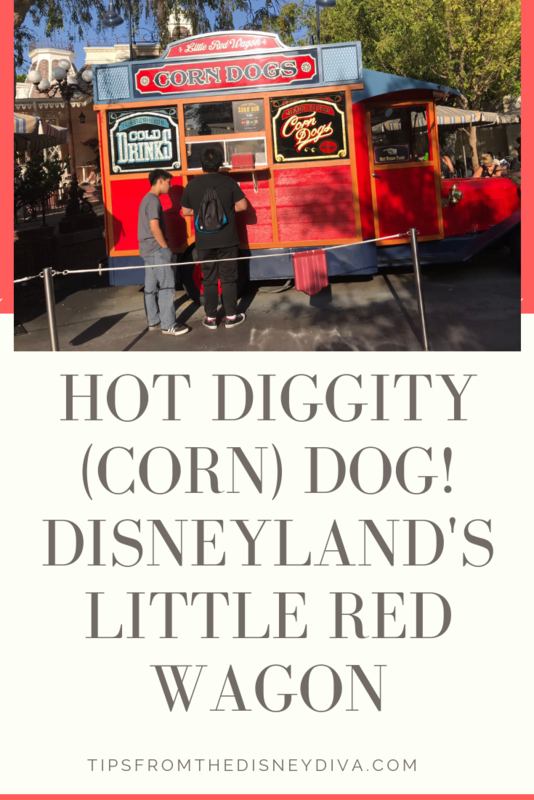 So when, on our first visit to Disneyland Resort, my husband suggested we grab a quick bite to eat at Little Red Wagon I was taken aback. 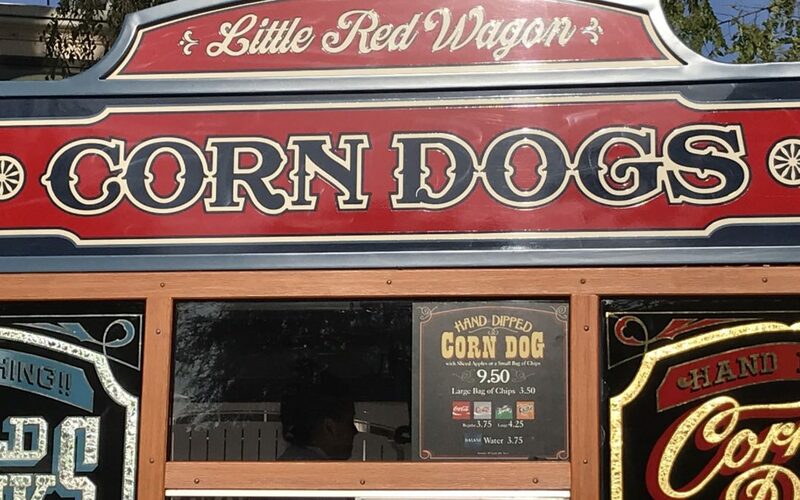 You see, Little Red Wagon is a corn dog cart. 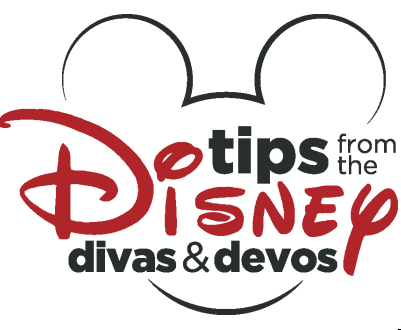 It’s easy to miss – tucked in a corner at the end of Main Street U.S.A. next to Plaza Inn. 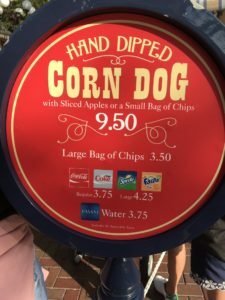 It’s not even listed on the Disneyland website if you search for it under “dining,” which I find a little puzzling since popcorn carts, churro carts, turkey leg carts, pretzel carts, and fruit carts are listed. Maybe since it’s a “wagon” and not a “cart,” it doesn’t rise to the level of being featured on the Disneyland website. Or maybe it’s just so it can remain a little-known treasure. Yes, I said treasure. Because even though hot dogs are not on my “favorite food” list, I do relish (no pun intended) these corn dogs! 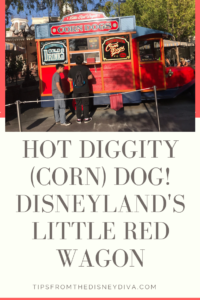 I’m so happy my husband encouraged me to have a bite of his on that first visit, and I’ve insisted we make Little Red Wagon a stop on every subsequent visit to Disneyland Park! Sitting on a bench in the hub enjoying a corn dog, drink, and chips while gazing at Sleeping Beauty Castle and just soaking in the magic has become a favorite tradition. 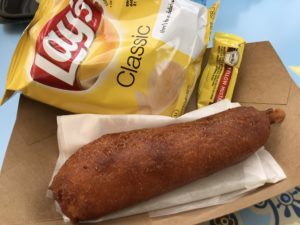 So, what makes me a fan of these corn dogs? First of all, they are made to order so they are piping hot and fresh. They are hand-dipped – none of that frozen and reheated nastiness here. And they are HUGE! Really, this is not a corn dog that you’d consider a snack. It’s more than enough to keep you going for an afternoon of character-meeting, space-traveling, jungle-cruising, pirate-looting, frontier-exploring adventures! If you’re looking for variety, Little Red Wagon probably isn’t the place for you. Your choices are simple – corn dog with chips and drink or corn dog with apple slices and drink. Naturally, there are a few choices as to the type of chips or beverage you prefer, but that’s about it. No sense in complicating things, I guess, when you have a terrific product. Once you have your corn dog, finding a place to sit and enjoy it may require a little planning. There are only a couple of tables next to Little Red Wagon. If the park isn’t too busy, you may be able to grab one of the outside tables at Plaza Inn, although cast members do tend to discourage that. We’ve usually been pretty lucky at finding a bench somewhere in the hub area, and when that fails we typically find a brick landscaping wall to sit on. Luckily, it’s pretty easy to eat a corn dog without an actual table. Diva Tip: If someone in your party prefers something other than a corn dog, (although why would they? Seriously, they’re delicious!) send them to Jolly Holiday Bakery Café right across the street. 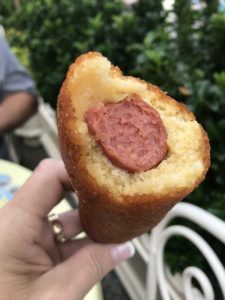 There is outdoor seating available there, and you can then just bring your corn dog over to that area to enjoy a table together.